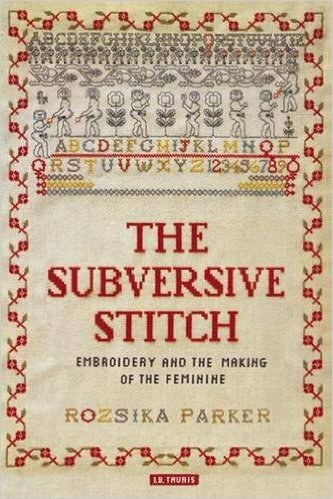 I’ve been reading the Subversive Stitch by Rozsika Parker, and i’ve found it quite interesting. Not only for the content and ideas within it, but also for some of the quotes i’m getting from the book. Quotes which could easily become an inspiration for my embroidery. It fits well with my patchwork artwork too, there’s sweetness and femininity within the work via the floral fabrics and patterns, but the message i’m trying to get across is all about strength within the genders. 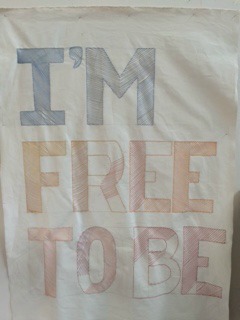 Some of the letters that I have embroidered have been left unfinished. This was unintentional at first, but it was brought to my attention that the unfinished letters were in the centre of the canvas. When painted, this is where the focal point of the portrait will be, so maybe it is best to leave those letters unfinished – so as not to distract attention from the central focal point. 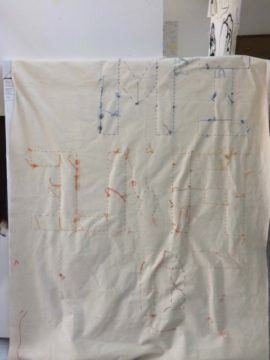 I have been embroidering the diagonal lined fill of my letters too tightly, so the letters have become embossed, which will make stretching the canvases extremely difficult. 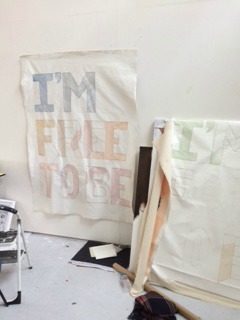 This isn’t really an issue for me, as I was planning on leaving these paintings as wall hangings. I also really love how the letters appear embossed. You can especially see this effect from the back view of the canvas, which brings me to point 3..
My ideas for displaying my work in the degree show. Since the back of my work is quite interesting, i think it would be a waste to hide it by pinning it to the wall. Perhaps I could hang the portraits from the ceiling so they are perpendicular to the walls. That way, the viewers can walk around and in between my works, giving them an interactive feel. I have a feeling that painting over the string will prove to be a challenge, and the string is so tightly sewn in some places, and loose in other. My plan is to finish both canvases, and then paint both of them together, so the textures, colours and emotional context remains the same through both of them, so they look like they belong together, rather than two separate and different paintings.